No book has had a greater impact on me as the Quran. For Muslims, it is literally the word of God, and it acts as a guide in all aspects of life’s journey. Like all religious texts, its messages are contested and often used both by those who seek to oppress and those who seek liberation from oppression. For me, the passage ‘stand out firmly for justice, as witnesses to Allah, even as against yourselves, or your parents, or your kindred, and whether it be against rich or poor’, is unambiguous, and a constant source of strength. I have three boys, Hamza (aged 13), Mikael (12) and Aslan (7). They are the centre of my world: they are challenging, bright and funny. I love being around them. Since 9/11 it feels like all of us have embarked on a new journey together. They too are now veterans of the anti-war movement and have taken part in numerous demos and rallies. The bond between mother and child is uniquely special, and I love looking at photographs of my children as they grow and develop. I trained as a psychotherapist and psychology is my first love. One of the costs of political activism has been the lack of time to devote to it. I am particularly interested in psychological models that are holistic and incorporate both spiritual and societal perspectives. I am also intrigued by psychoanalytical models, with their emphasis on the dynamics within the individual and how we are shaped by our developmental experiences. However, I am not entirely dismissive of the self-help genre, even though it is often looked down upon by ‘professionals’, and indeed I would recommend some to patients. Of all the writers in the genre, Susan Jeffers comes out tops for my money. This book is one of her bestsellers and gets the mix of readability, practical guidance and cheesiness just right. Although this is a fantasy novel for children, I love it. One of the consequences of the recent cold spell has been the way our landscape has been transformed by the snow. The fragile beauty of it evoked images of the magical land of Narnia for me. The theme of good fighting evil is certainly not new, but this book manages to combine the thrill of an adventure story, the complexities of moral challenges, and enchanting characters who resonate in the imagination for a long time. Certainly long enough for me to name my youngest after the lion in the book, Aslan. I don’t accept that political models that result in thousands of children dying of hunger each day represent either the height of human ingenuity or the natural order of things. Naomi Klein’s critique of the dominant economic model is approached with an intellectual rigour that gives both clarity and a formidable weapon to activists. This book is a masterpiece in exposing the fundamental brutality that drives the capitalist system. It is an exposé of how free market fundamentalism leads to ruin and chaos, and a reminder of the ruthlessness of the global elite, whose interests are irreconcilable with those of the vast bulk of humanity. We need real, living political alternatives to capture the public imagination that another world really is possible. Developments in recent years in South America are hugely significant in that regard. This short book is written by a Chilean activist forced into exile after the1973 military coup. Since then she has clocked up decades of activism, first in Cuba and now in Venezuela, engaged in revolutionary processes to build socialist alternatives. Her book is teeming with wisdom and relevance to those seeking to build broad parties of the radical left here in Britain. As an Asian woman Arundhati Roy is simply an inspiration and role model to me. She knows no fear and speaks the truth, however unpalatable it is to those in power, either in her homeland of India or globally. She is on the side of, and a voice for, those most downtrodden by gender, caste or class. Her recent writings on the oppression in Kashmir are a further testimony to her fierce compassion. Her courage astounds, and through it she articulates a global perspective with a humanity that uplifts and gives courage to the rest of us. As well as her personal integrity she is an extremely talented writer, in both fiction and non-fiction. In this short book, she articulates an impassioned critique of the war on terror, which is made even more powerful by her particular eloquent and poetic style. Salma Yaqoob is the leader of the Respect party and its general election candidate for Birmingham Sparkbrook. Donations to her general election campaign can be sent, payable to Respect Birmingham, to 51 Portman Road, Kings Heath, Birmingham B13 0SH. Her selections can be purchased here. 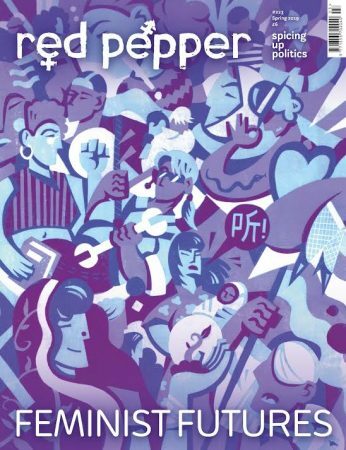 A portion of the sales from purchases made through Red Pepper/Eclector’s book store contribute money to Red Pepper. Not all titles are available.